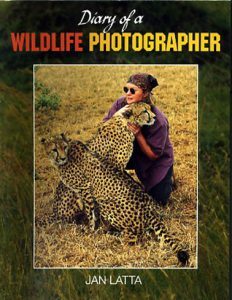 Karl Ammann captured a magic moment in my life when I had a wonderful encounter with two cheetahs in Kenya, Africa. This fabulous photograph has been my ‘signature’ for all my schools and festival promotions and featured on the front cover of the Diary of a Wildlife Photographer book. Karl was named Heroes of the Environment, by Time magazine. His lifetime work as an author, wildlife photographer and conservationist have appeared in the New York Times, Newsweek, Stern, and National Geographic Almanac magazines, and he co-authored two books Conserving Nature and Eating Apes. It is a privilege to have known this courageous man for over 20 years.